Yesterday I began the process of rebuilding the Lark's front end suspension. This has been a long time coming - the engine and transmission have been done for months, but the front end was so bad I wanted to rebuild it before reinstalling them. 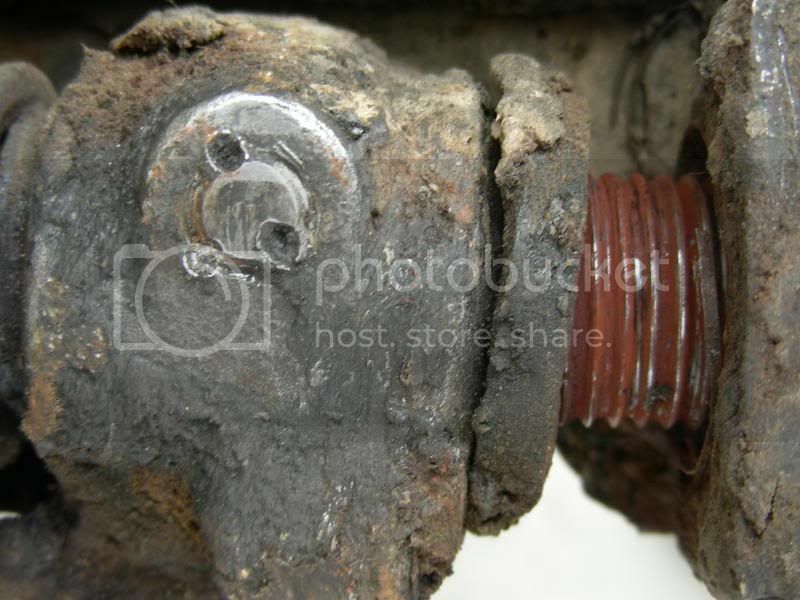 As you can see in the picture, the components are so worn that the car was going down the road knock-kneed, and no amount of adjustment was going to bring it back to life. I ordered the Big Box O' Suspension parts from Studebaker International. It was a big chunk to bite off at one time - the rebuild kit is nearly $1k, but they give you a "large order discount" that knocks the price down 15%. Then you get about $250 more back when you send in your old kingpins and steering bellcrank, so it comes out to about $650 all told. I also got a new set of coil springs wound to factory spec from Coil Spring Specialties. They are two turns shorter than the Stude originals, but they're about 0.035" thicker (I measured), which makes up for the shorter length. I got started about 9AM, putting two sets of jackstands under the car just for good measure. The shop manual gives pretty clear instructions for removing the springs and disassembling the front end, but I wound up using the process posted on Bob Johnstone's Avanti Pages, an excellent compilation of Stude technical info. 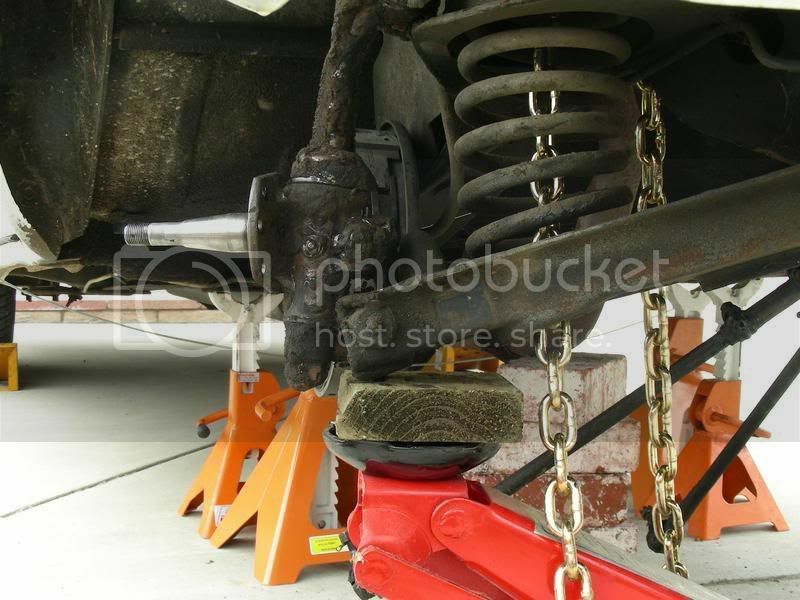 The manual calls for compressing the spring with a floor jack and then releasing the upper inner pin from the frame, peeling the upper A-arm and kingpin off to the side of the car, and then releasing the spring by lowering the jack. Bob's process seemed a lot safer to me: you still use the floor jack to keep the spring compressed, but you instead release the lower kingpin retaining nut, allowing the kingpin to come out of the lower A-arm when the spring is released. It's important to jack the car and place jackstands from the correct locations. 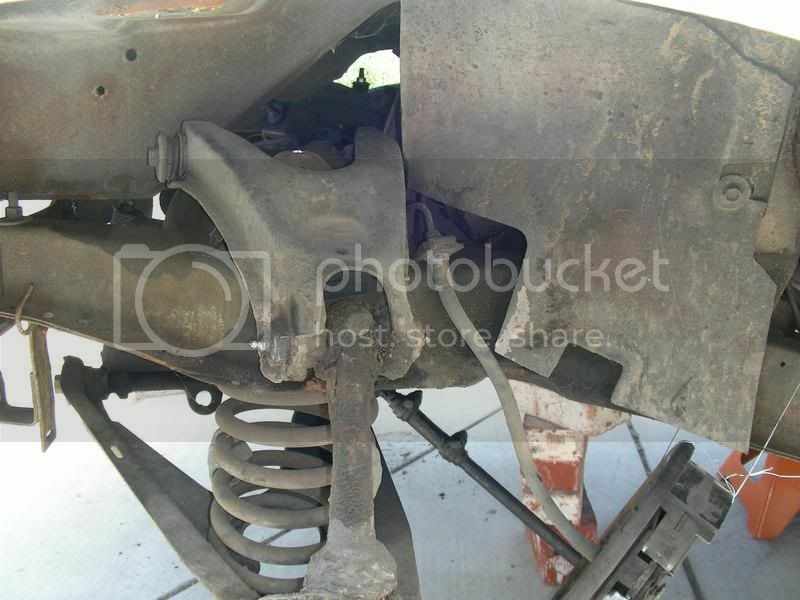 Lots of people will put jackstands under the transmission crossmember - which caves in the crossmember (mine is). Instead, you place the stands under the frame just behind the wheel arch, about even with the front door posts. 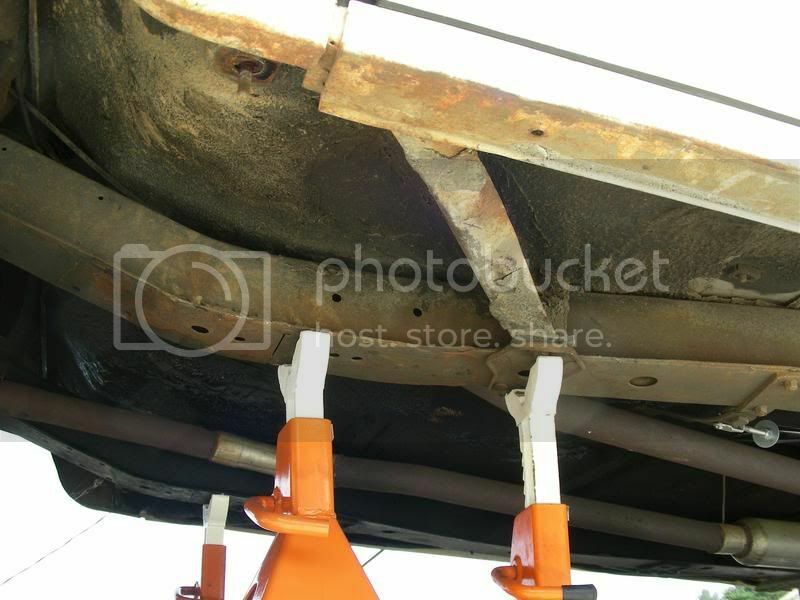 There's a frame plate that connects to a body support on each side; the jackstand fit naturally into the plate. For safety's sake, I also put a 2nd set of stands on each side. (The rear wheels were chocked firmly front and back as well.) 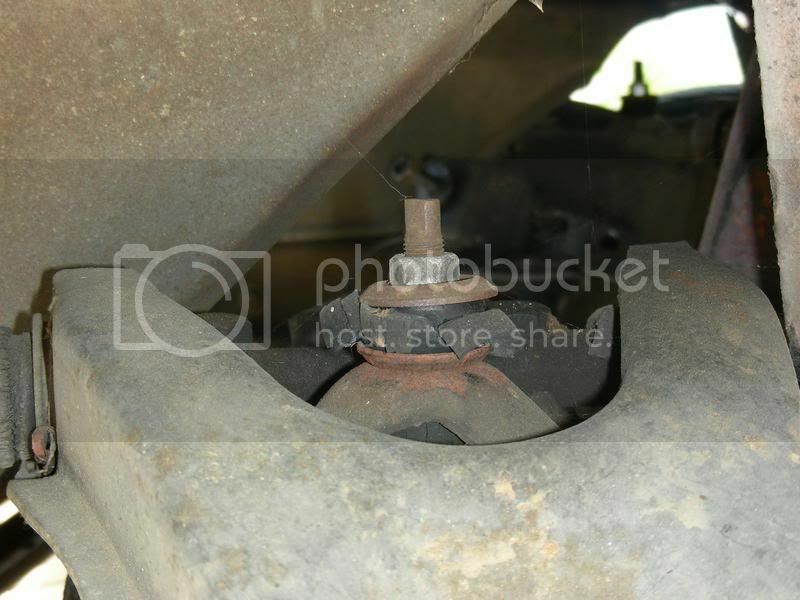 The front jacking point is under the steering bellcrank center pin. After unbolting the backing plate, I wired the assembly to the frame rail to keep the (at least 20-year-old) brake hose from stretching or breaking. You can't see it in the photo, but the upper A-arm rebound bumper, located on the frame below the upper arm, is completely destroyed, and crumbled apart in my hand. There was also an amazing amount of crusted dirt and old lube covering every part - I must have scraped off at least a pound of dried crud. It covered the kingpins, filled the A-arms, coated the fittings and supports. I really believe that someone left this car in a field of mud for a long time; there's even dried mud and thistles inside the frame rails! At this point, I made a bit of a mistake. There is a tapered key that locks the lower kingpin support to the lower outer pin, which must be driven out. I forgot this step and, once the A-arms were out, found my mistake. The keyneeds to be driven out upwards while the suspension is still assembled, so that the weight of the car and the pressure of the spring pushes down against your pin punch while you drive the key up. You can see the top of this key in the photo; apparently the factory staked the key once installed by center-punching it. Since I missed this step, I'm going to have to have it pressed out hydraulically. I used a pickle fork to remove the tie rod from the steering knuckle, and it was time to free the spring. It's not in the shop manual procedure, but Bob's technique (and several others I read) say to put a safety chain through the spring, over the frame rail and even underneath the floor jack. In case the spring decides to fly out of the A-arms when pressure is released, this will keep it from flying through you. 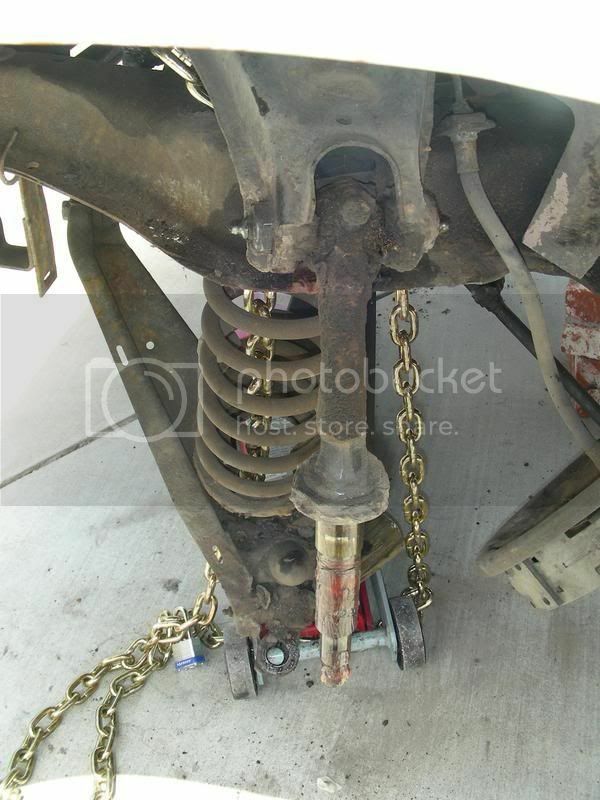 In this photo you can see the routing of the safety chain through the spring, around the frame rail, under the jack. The jack saddle should support the A-arm just inboard of the outer lower pin, NOT below the pin itself. 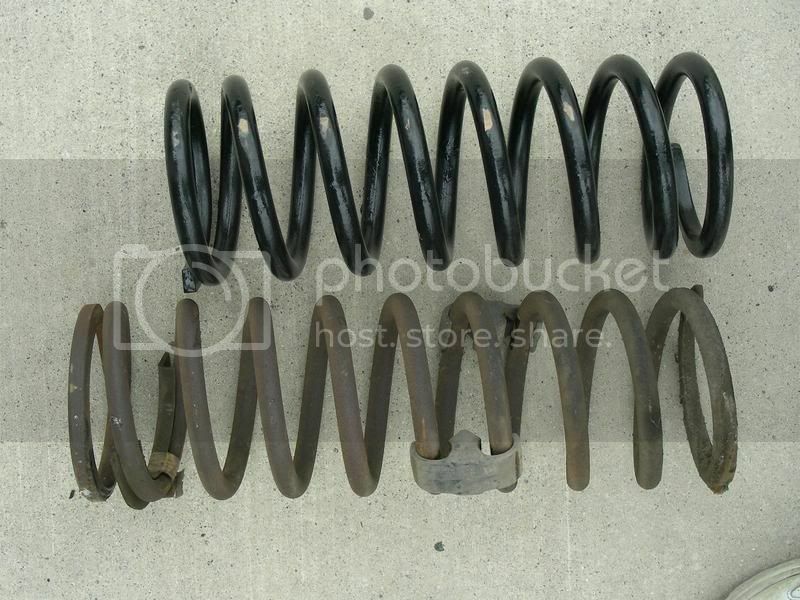 Make sure the car is jacked up as high as you can get it, because you'll need a lot of space for the spring to decompress. Bob's instructions say you'll need at least 6 inches between the bottom of the kingpin and the floor; 8 inches are better. After raising the jack under the A-arm to keep pressure on the spring, I removed the cotter pin and nut from the bottom of the kingpin and, with my wife spotting for trouble, slowly released the jack. Note that the jack handle is pointing toward the car's centerline, so that if the spring flies, you're not in its way! The second I released the jack, the spring pushed the lower A-arm down and the steering knuckle dropped off the kingpin onto the floor. Inspection of the needle bearings once again found that mud-colored grease, but the bearings seemed OK. There was quite a bit of heat marking on the kingpin in the areas of the upper and lower thrust bearings, though. Once the spring is decompressed, it pulls right out of the A-arms. Now, using a breaker bar and a 1-1/8" socket, I unscrewed the bushings from both the upper and lower outer pins. Undoing the pinch bolt on the upper kingpin allows the upper pin to come right out. Having pressed out the tapered key from the lower pin (as described above) allows the lower pin to be driven out of the lower kingpin support using a brass drift. At this point, I found that one of the bushings on the lower outer pin was seized to the pin. This is particularly distressing since the bushing and pin are designed to rotate together as the A-arm moves up and down! Probably one reason why the suspension was so shot. Hopefully this condition did not tear up the lower A-arm; if it did, I'll need to obtain a new used arm. Won't know until the parts are cleaned up and inspected. 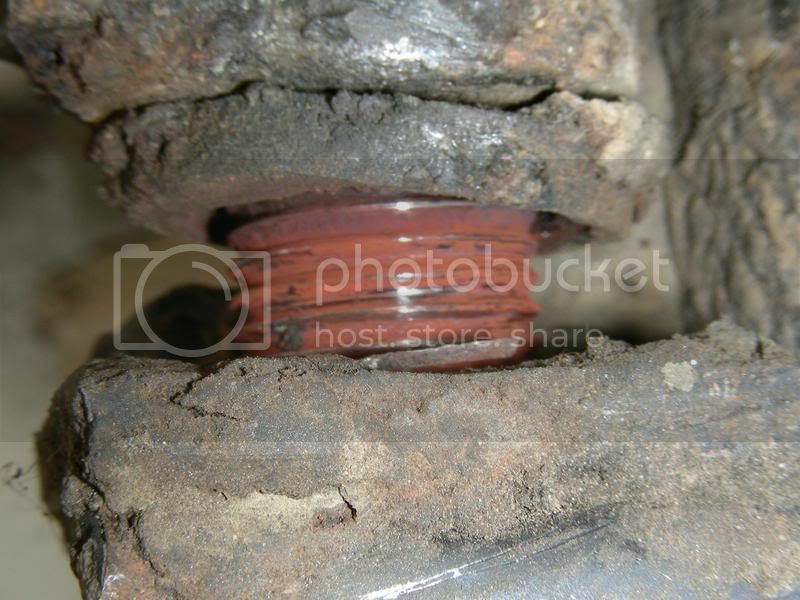 With a lot of leverage and effort, the bushing began to back off the pin. 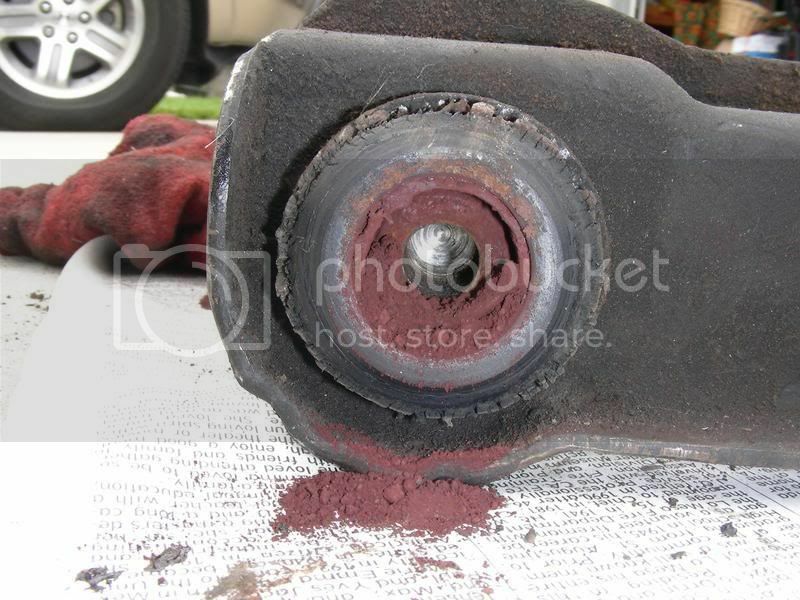 That's when I noticed the rust; this is why the bushing and pin were seized. Water got into the joint and rusted the assembly from within. Perhaps if the pin had been lube sometime within the last 20 years, this would not have happened, but when the bushing came off it was empty and the remaining lube inside was pitch black. a good length of time. Finally, after 7 hours of work, the driver's side suspension was off the car. I had hoped to get both sides apart, and while it was only 4PM, I was beat. Now that I know what to expect, the other side should go faster, and I'll tackle it next weekend. 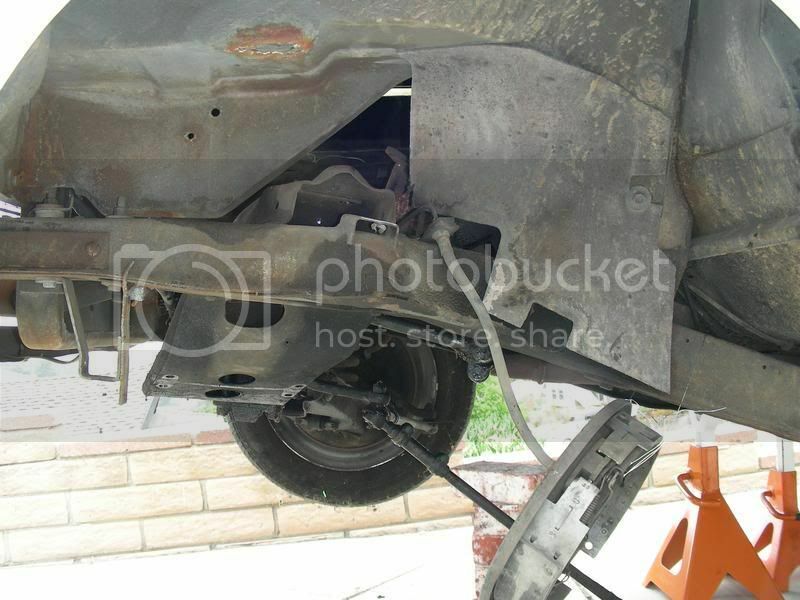 I jacked up the car and lowered the jackstands to nearly road height, and placed another stand under the steering bellcrank for safety's sake, and then chained the chocks to the rear wheels to prevent pilfering. Then I took a half-hour hot shower :) Stay tuned for more! 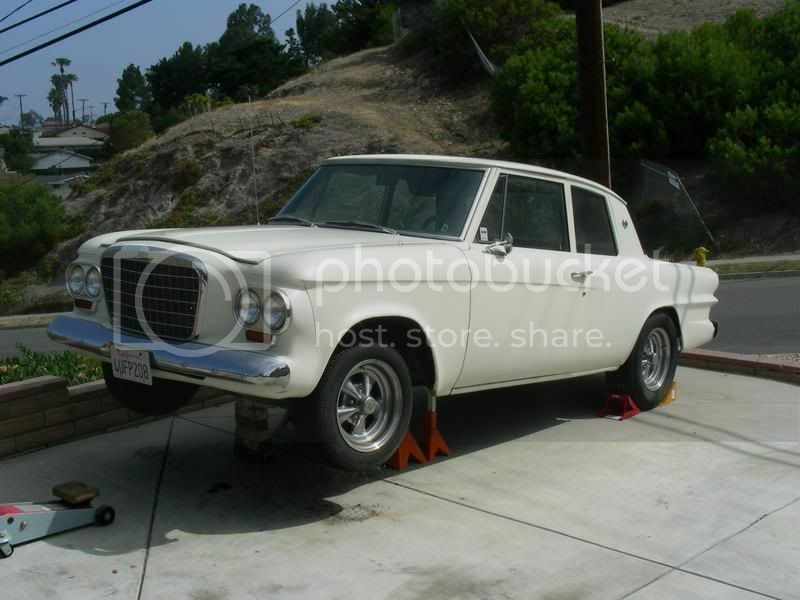 Did the front end come up any higher with the new springs,I have a 1953 Studebaker commander and I want to raise the front up 1 to 2 inches higher,trying to find out if HD springs will do it or heavier taller is what I need. Tom, it sure did. It was noticeably higher. HD springs, in my opinion, will just give you a stiffer ride up front; unless you are planning on traveling some very bumpy road in your car for a majority of your driving I would not suggest them. Go with the OEM-spec springs and you'll be much happier. 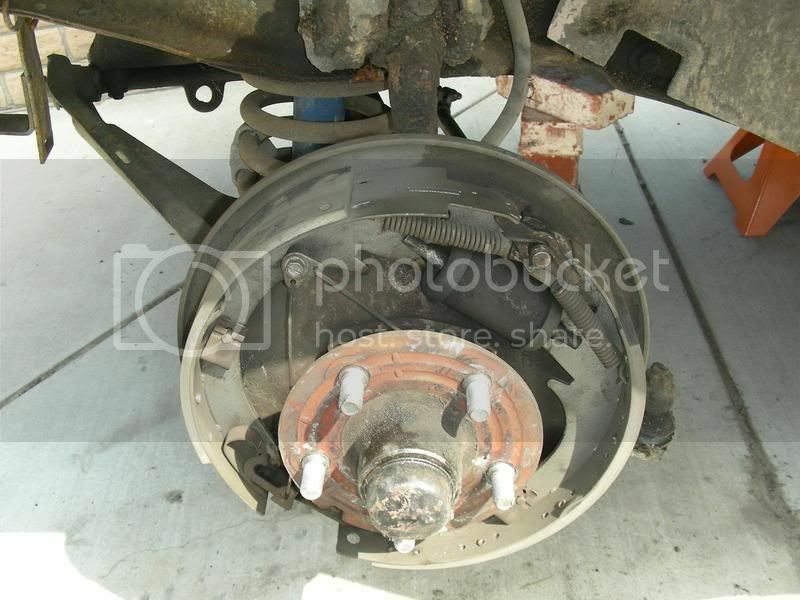 Thanks,Rear are already done,did you happen to measure yours before replacing the coils. 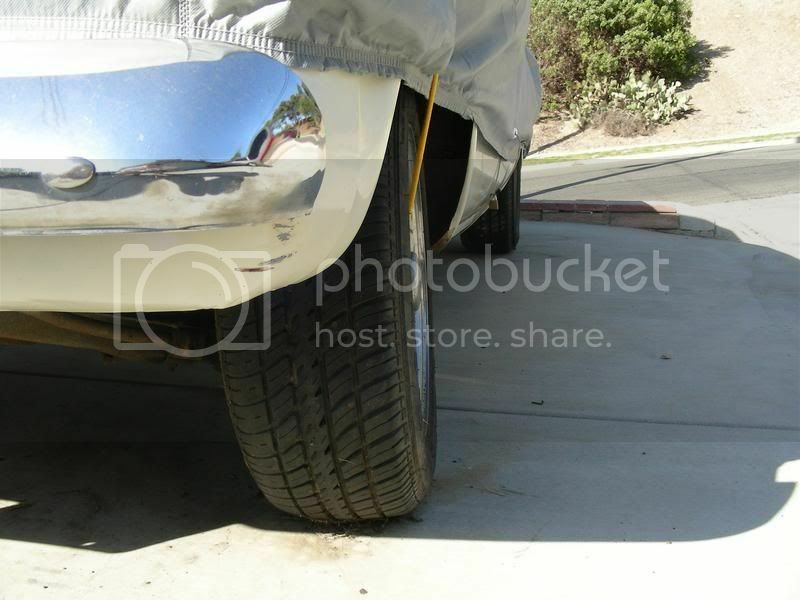 Like ground to bottom of fender wheel opening.I am looking for a slight Gasser look,to be able to see the whole tire under the wheel well.Jon and Betty Myer can get met a set stock or HD. Tom, I did measure, but the old coils were so compressed from age that the new ones bore no relation to them in height. However, once installed, the ride height was correct, even though they differed in initial size. Great blog, which I continue to enjoy. 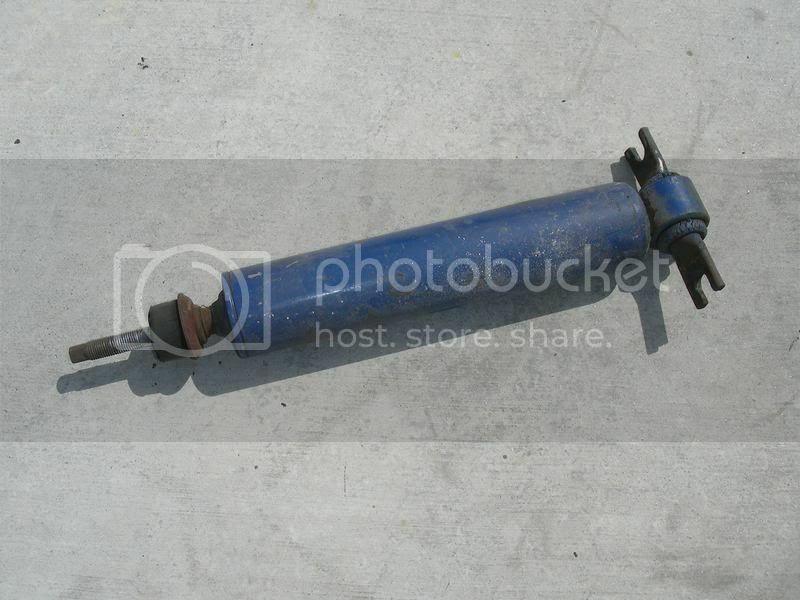 While I have done a lot of work to my fleet of Studes, I have never rebuilt a front suspension...but am about to start! I can't seem to be able to view your pictures associated with the article. If I was to supply my contact information, could you please forward? Eric, thanks for the nice comment. The photo problem was due to a picture host that went awry, but it's fixed now. Good luck on your rebuild!